That special day is coming up and you’re still scrolling through Pinterest to find the right theme for your wedding in Miami. It is time to stop the scrolling and take a deep breath. 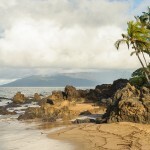 First of all, your wedding is your special day and you should tailor it to your desires. So, how do you adapt your love story and personality into your wedding? 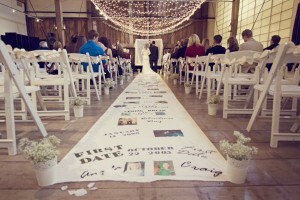 Have you ever considered incorporating your love story into the aisle runner? Set the stage for an enchanted walk down the aisle with a personlized wedding aisle runner. Before all eyes follow the bride as she moves towards the enthralled husband-to-be, have your groomsmen roll out a stunning customized path to mark your way. An aisle runner can be very special if you take the time and put meaning to it. You can do more than just decorate it with your initials or name and the date. 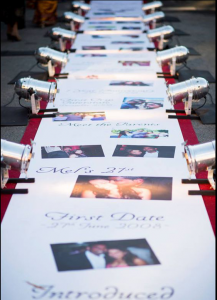 Personalizing your love story and aisle runners can allow guests to see the growth of your love and relationship. It is beautiful if the aisle is printed with some of your pictures. Just imagine how lovely it will be to walk down the aisle and look at photographs showing you at your best moments, laughing and having the time of your life. One of our favorites is a personal timeline. Show how or where you first met, your first date, etc. Personalized aisle runners have become increasingly popular. It makes the walk down the aisle even more interesting. Something funny, sweet or cute like an arrow pointing to your partner saying: “This way to wedded bliss” or “The beginning of forever”. Framed monograms are a great way to maintain your personalized aisle. Many people choose to cut out the monogram or lyrics and hang them in their home. Some couples choose to make blankets or quilts from the aisle runner. It is also possible to add other fabrics, such as pieces of the wedding gown or heirloom fabrics. The use of the aisle runner began as a way to protect the bridal gown from dirt and debris. That still applies, especially for brides who have outdoor weddings. Imagine that the grass of the leaves or grains of sand would get stuck to the train of your dress while you walk down the aisle to your husband to share your vows. A runner can help keep your gown pristine on your big day, no matter where you hold your ceremony. Although it only takes a few minutes before you get to the alter, the path toward the alter is really a walk to remember.